Many people do not realize that the Disneyland Character Meal Vouchers do not have to be used on the Character meals. Why is this important? Well, because you can often find a Disneyland Vacation package that will include character dining vouchers as part of the package for a great deal. 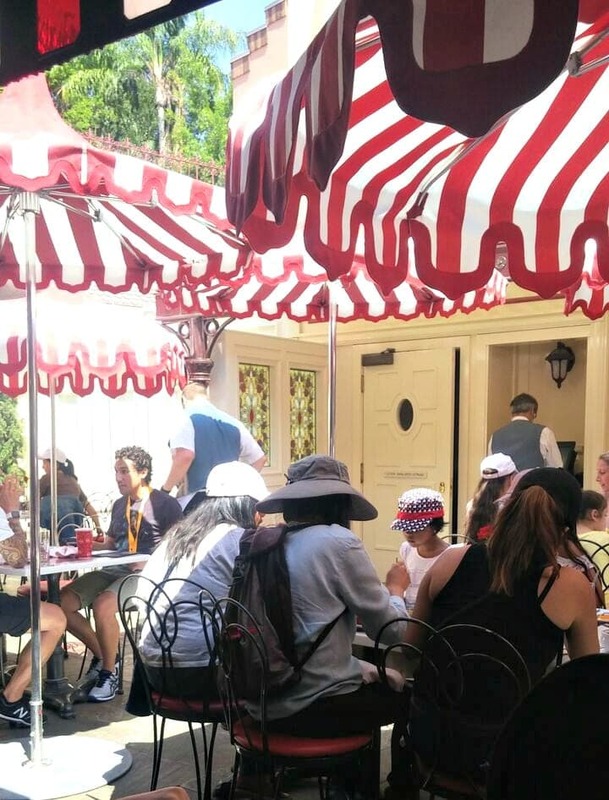 If this is the case, you can save more on your food costs by using them standard Disneyland dining options verses the Character Dining options. We will share with you below how that works. Other then possibly saving a little bit, some folks find it easier on their budgets to be able to plan and pay for some of their food costs ahead of time. 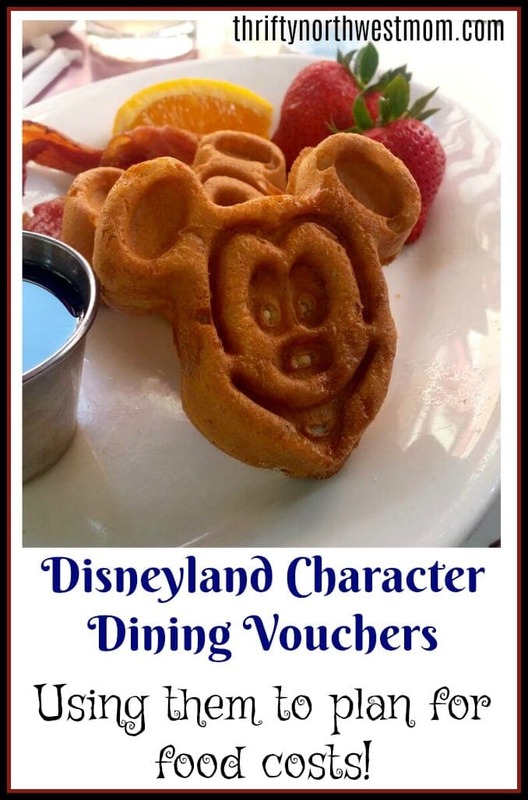 If you know you will be eating in the Disneyland parks or hotels, using the character dining vouchers can be one way you can prepay some of those food costs. Disneyland Food – How To Save the Most Eating at Disneyland! The vouchers include tax and gratuity, and at certain times of the year you can even get discounted prices, so sometimes they are a good way to get a slight discount on Character Dining options at Disneyland. You will also sometimes find the Character Dining Vouchers bundled in Disneyland Vacation packages. If so, and the package is a good deal all around, you can use these vouchers to save on your Disneyland Dining Experience. 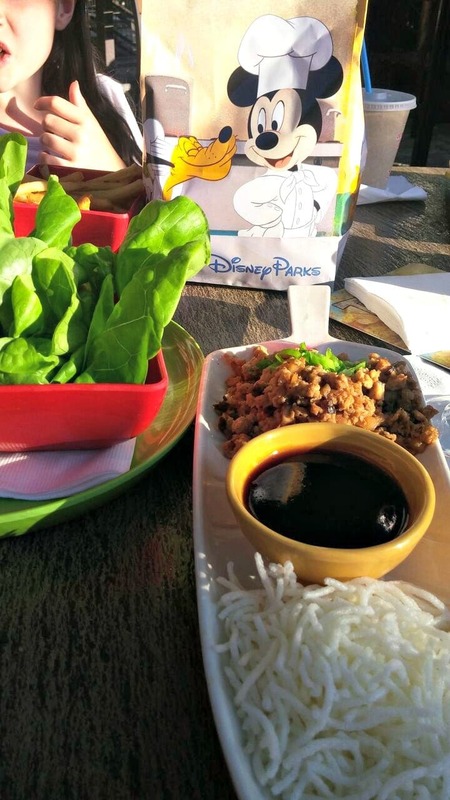 If you do want to use them for Character Dining, be sure to check out our article here on what the Best Character Dining Choice for your Family Is. If you want to use them to make your food budget stretch further, here is how you can do that. If you are able to purchase them when they go on sale you will save money. Since you will be able to use the face value of the voucher, if you get it on sale, you are saving! If they are bundled into a great package deal. This is the best way to save, as you would be paying for the package anyway, so if you can find one where there is not a big added cost to include the vouchers then you will really save. We have information on where to find great package deals for Disneyland here. You can also use them to budget ahead of time. This may not save you money, but it will help you pay for some of your food costs before you leave on your vacation, which may help you spread the cost out more. If you want to be able to plan ahead and pre-pay some of your food costs, this is really the only way we have been able to figure out how to do that at Disneyland. 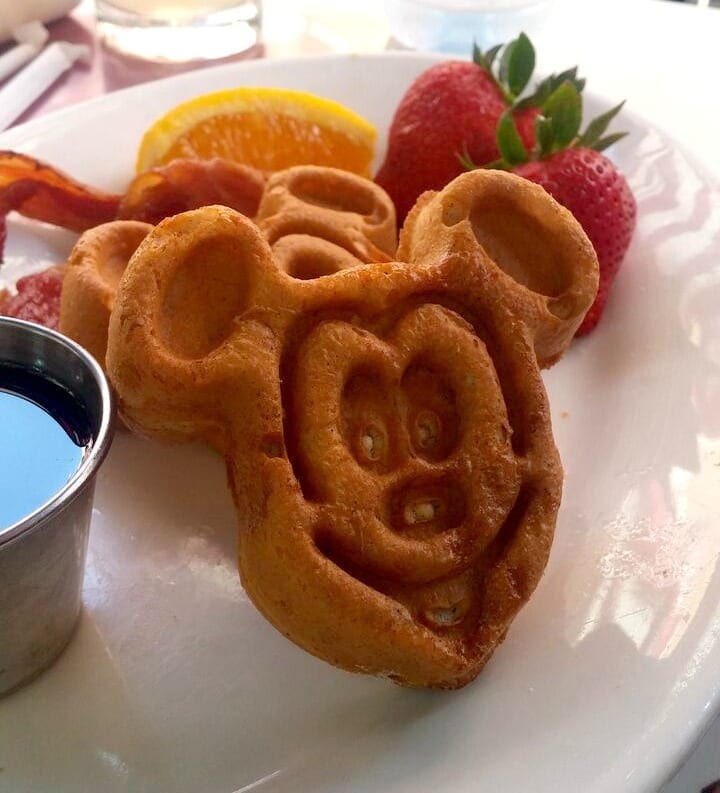 Unlike Disney World, Disneyland does not offer pre-paid food plans. You are able to use your Disneyland Character Dining Vouchers to eat at any Disneyland restaurant at the face value of the voucher. For example, an adult premium character dining voucher would have a current value of $48, or a child premium voucher would be $28. 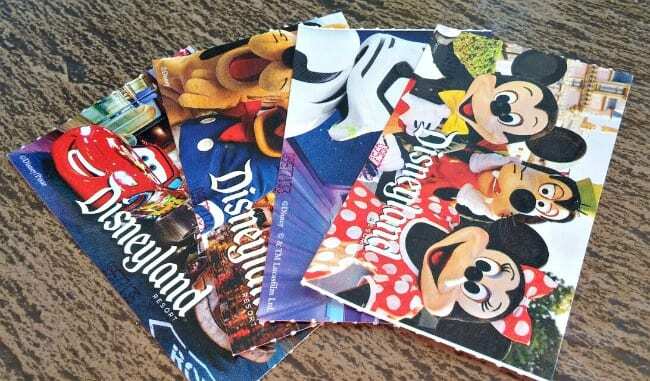 They can be used at the Disneyland restaurants in the Disneyland and California Theme Parks, and the three Disneyland Hotels (but not Downtown Disney). Some info on the internet says that you can only use them at sit down service style restaurants, but we were able to use them at all the restaurants in Disneyland or their hotels (be sure to ask when you pick up your vouchers, and they will clarify the current policy for you). You will have to use at least one entire voucher on each purchase (you can use more then one), but you will NOT get change back, so you will want to be sure to use them on a meal that is at least the price of the voucher (not hard at Disneyland). They will not cover alcoholic beverages either, but will cover other beverages. Why would you want to use Character Dining Vouchers for anything other then Character Dining you ask? Well, if you were able to get them at a savings, or as part of a bundle, you will be able to stretch more meals out of using them separately then you will if you use them all on one character meal. 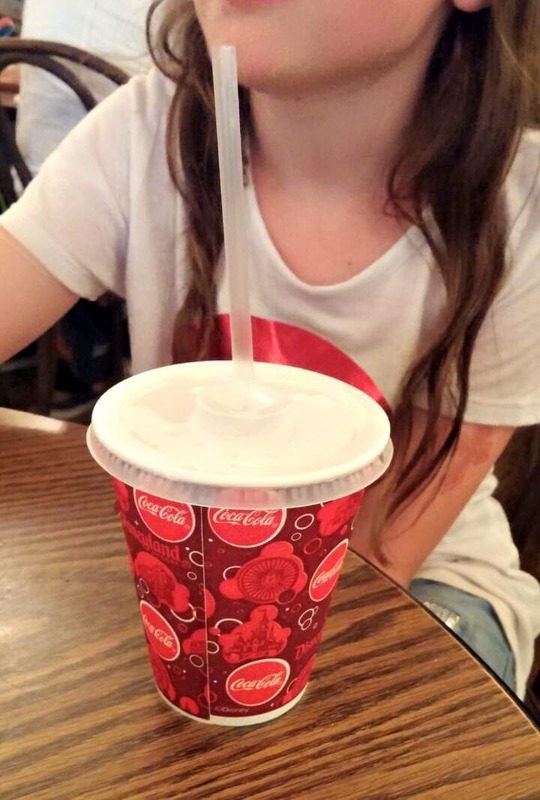 Here is how this worked on our recent visit to Disneyland. Kids meals range from $5.50 to around $8 on our trip. Adult meals ranges from $10 – $15 at the more casual restaurants (Note – if you want to eat at the finer dining at Disneyland, these won’t get you much further then they would using them at a Character Dining meal). My husband and I were traveling with our two daughters. One of our kids is 10 (considered an adult at Disneyland, per their pricing for the tickets and vouchers), so we had three adult vouchers and one child voucher that we got through aRes travel. Now we could use those on ONE character dining meal for the family, or we could use them to get FOUR meals/snacks throughout our stay (which we did). One tip here. I highly recommend ordering water with your meals in the park. If you order soda or other beverages, for four of us it added and extra $12 to $15 to our bill. If you are in a spot that has fountain drinks, water is free (bottle water is not – it can be very pricey at the park). 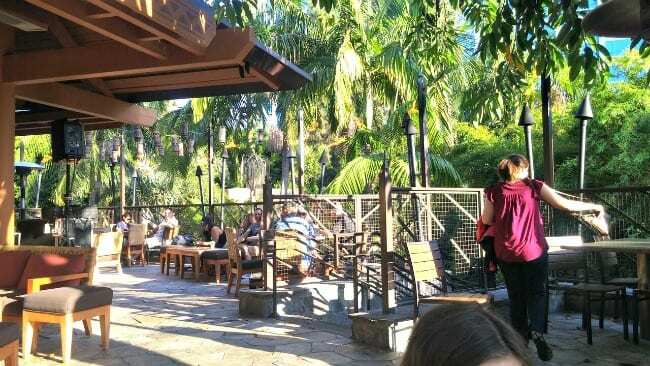 We ate one night at the Trader Sam’s Enchanted Tiki Bar at the Disneyland hotel. We like the outdoor dining patio, and to get away from the crowds at the park sometimes, so this was our first nights choice. The bonus is that sometimes you might catch a Disney Character roaming the hotel grounds! Our kids got snack packs for $5.50 each, and I ordered Chicken Lettuce Wraps for $11, and the hubby had a burger for $13. So, if you drink water with your meals, a family of 4 can eat for around $35 to $40 plus tax depending on what you order (it will add up much quicker if your ordering beverages and apps, etc, but you can keep the costs to around the price of one meal vouchers if you order carefully). This means that by ordering like this, we were able to make our 4 character dining vouchers cover 3 meals out, and one snack (we used the kids voucher to cover snack time one day), vs. just the one meal it would have paid for if we used it for character dining. This was breakfast one day at the Carnation Cafe. Its a great in park stop for breakfast. Dinner at The Plaza restaurant in Disneyland. This stop was great for kids who like noodles, my husband got the chicken meal and I ordered a salad. 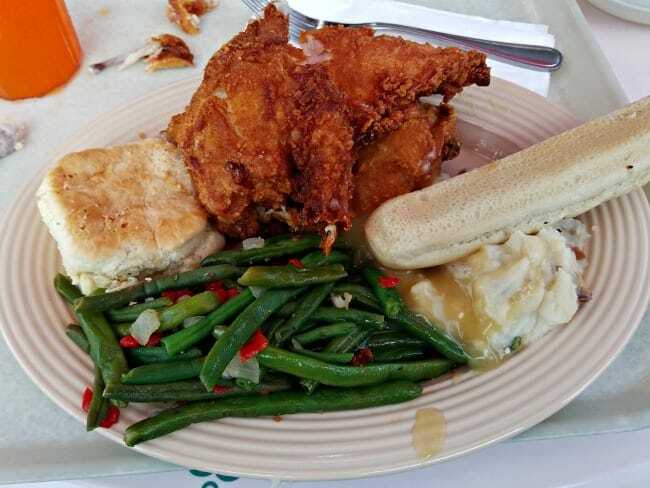 The chicken meal was a little more, this meal costs us around $46, but its a counter you order from so there is no tipping requirement) so it was just a few dollars over our voucher amount. 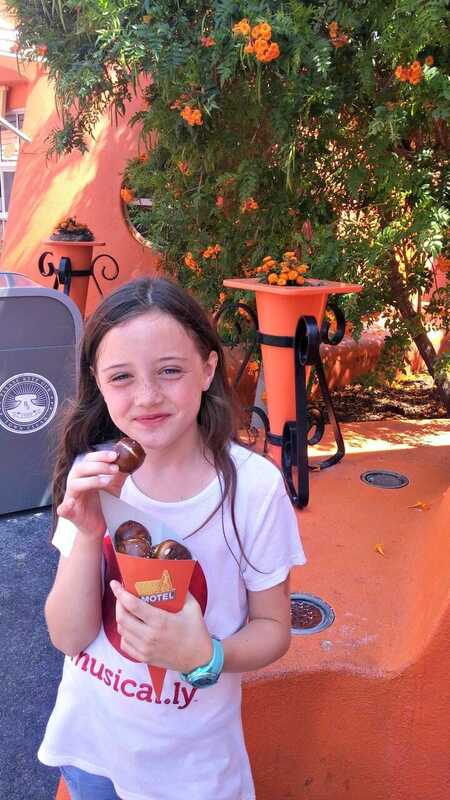 We did snack time at the Cozy Cone Motel spot in the California Adventure. A few frozen lemonades and some snacks like pretzels or ice cream added up to the $22 that our child priced voucher was worth. 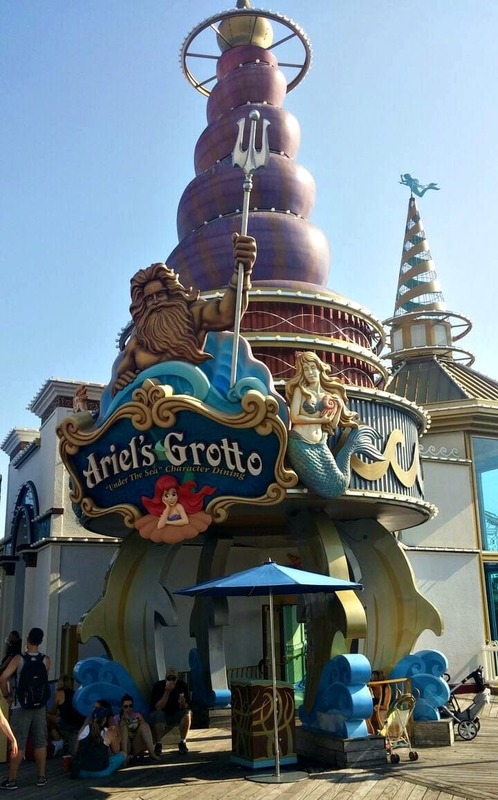 Find Disneyland character meal dining vouchers at aRes here. Be sure to check out our Disneyland Deals page here for many more savings tips! 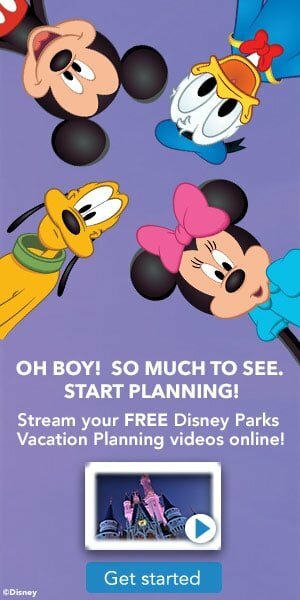 Disneyland Ticket Discounts – How to Save On Getting Into the Parks! Staying Off-Site When Visiting Disneyland – Best Neighboring Hotels To Stay At! And many more articles to help you plan the best visit to Disneyland possible!